We were recently invited to Sunday lunch at the home of one of my son's friends. I had heard that the lady of the house makes a mean roast, so felt I needed to make a deluxe pudding to follow the scrumptious lunch. 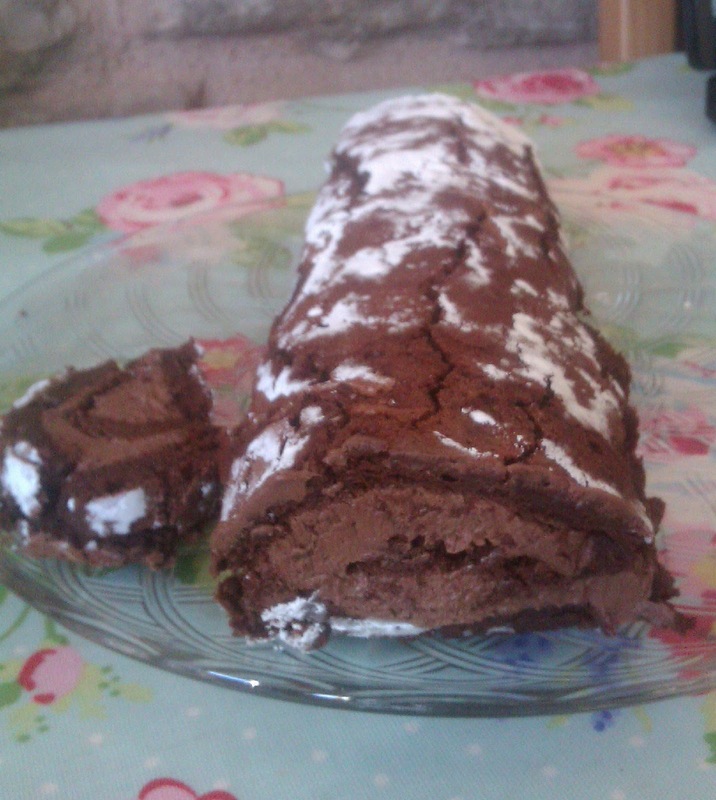 I trawled through my cookery books until I came across a recipe that I hadn't made in years, Chocolate roulade. It just jumped out at me because in the last series of 'The Great British Bake-Off', Mary Berry chose it as one of the technical challenges. I remember thinking, whilst watching the bakers battling to get a good "roll" on their roulades, that I had made it many years ago, during my dinner party phase in the 90's and never thought of it as that difficult to make. Perhaps my memory was playing tricks on me! Time to dust down the recipe and give it another whirl. This recipe has the added challenge of making a chocolate ganache for the filling. Chocolate and cream boiled together does slightly unnerve me as both ingredients can be a little temperamental if not handled correctly. Thankfully the cream and chocolate behaved beautifully and I ended up with a fab looking and tasting dessert that got polished off by us all after the amazing pork roast served by our hosts. Preheat the oven to 200c. Oil and line a swiss roll tin measuring 23x30cm. Brush the paper with oil. Gently melt the chocolate and milk in a bowl set over a pan of barely simmering water, (do not let the bowl touch the water in the pan) and once the chocolate has melted stir until a smooth consistency is achieved. Whisk the sugar and egg yolks until pale and fluffy. Stir the chocolate mixture into the egg yolk mixture. Using a metal spoon, stir a little of the egg whites into the chocolate mixture to slacken the mix. Fold in the remaining egg white. Spoon the mixture into the tin, move the tin around until the mixture reaches all corners of the tin. Bake for 12 minutes. Remove from the oven, leave in the tin until cold with a damp tea towel over the cake. For the filling, melt the chocolate and cream together over a very low heat stirring gently until the chocolate is melted. Bring the mixture to the boil and then remove from the heat. Stir the mixture occasionally until the mixture starts to thicken then whisk with an electric whisk until a thick mousse consistency is achieved. If the mixture does not thicken, place in the fridge for 5 minutes and then whisk again. When the cake is cold turn it out onto a sheet of grease proof paper sprinkled with the icing sugar. Carefully remove the backing paper and spread the ganache over the cake. To roll up the cake, make a small incision along the edge you are going to roll from to help form a roll and use the grease proof paper encourage the cake to roll up. This cake will crack as it is rolled. This is part of the charm of it. Dust with more icing sugar if required. thanks Gem, the good news for you is that this recipe is naturally gluten free. You now know what you'll be getting next time we see you!